Thames Valley Police is appealing for witnesses following an attempted kidnap which occurred in Milton Keynes. Police made the appeal on Wednesday after the incident occured on Monday (January 22) at about 12.20pm in Heathfield, Stacey Bushes. The victim, a 26-year-old woman, was walking alone when a metallic grey BMW pulled up next to her. A male passenger then got out of the car and grabbed hold of the victim’s wrists and attempted to pull her into the vehicle. A black Audi A3 then pulled up behind the offender’s car and he released the victim before getting back into the vehicle. Both vehicles then drove away in the direction of Great Monks Street. The victim sustained minor injuries as a result of the incident, but did not require hospital treatment. The offender is a black man, aged in his 20s and is about 5ft 8ins tall. He has short black hair and a thin black moustache, and was wearing a black Adidas hooded top and black tracksuit bottoms. The driver of the BMW was also a black man and was wearing black clothing. 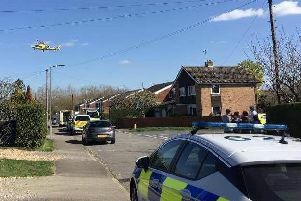 Investigating officer Detective Sergeant Adam Billingham, based at Milton Keynes Police Station, said: “This was obviously a frightening incident for the victim and we are carrying out an investigation into it. “I would like to speak to the occupants of the black Audi A3 which pulled up behind the BMW, as they could have vital information about the incident.